A sustainable paradise surrounded by the Indian Ocean, Soneva Fushi is one of the few resorts in the Maldives that has it all: service, laid-back luxury, and a slow life attitude. Imagine being dropped off in the middle of the Indian Ocean on a small dingy of a dock, where different shades of clear turquoise water surround you. You can’t see anything around you, except for a few curious fish below and just as you’re debating jumping into that water, you see a speedboat come towards you. But that speedboat isn't just any speedboat, it’s a luxury vessel, full of friendly attendants, fresh coconut water and cold towels to cool you down, as you make your way to a private island. Welcome to the start of our journey to Soneva Fushi. Before we could disembark the boat to step on our own slice of paradise, staff quickly collected our shoes, as the attitude at Soneva Fushi is “No Shoes Needed.” Finally a luxury resort that knows barefoot luxury :) We were greeted at the dock by our “Mr. Friday,” or our personal assistant (named after a character from Robinson Crusoe) and as he was making introductions and bantering with us, I couldn't help but be distracted. My eyes wandered to the thick, lush jungle full of tropical trees plants in front of us. Somewhere, hidden amongst this, was a villa calling our name. My jungle fantasies were coming true, and at that moment I knew...this places was special. During our time in the Maldives we ended up staying in both of the Soneva properties, and their brand ethos soon became apparent. The team behind Soneva Fushi is a big believer in sustainability and ensure that the beautiful islands the properties occupy (as well as the planet as a whole) remain in the pristine condition in which they were created. Soneva has won countless awards, including the Positive Luxury company's prestigious Butterfly Mark,which recognizes its work in the fields of social and environmental responsibility. If you get a sec, make sure to check out some of the cool ways Soneva is giving back. Much of the island’s vegetables are grown on the island to help the hotel meet their sustainability goals. The hotel’s villas are dotted around the edge of the island, while the interior is largely left as nature made it. To get to our villa we drove through the palm trees on one of the white sand roads that allow you to travel throughout the island. It was on the way that we started to get a sense of how big the island is. While we made our way through the forest, the only evidence of humanity were the little wooden signs at every turn telling you where to go. When you do stumble upon one of the hotel buildings, you will be struck by the elegance of its design. Using local elements and bright colors, the entire vibe is laid-back and beachy.. One of the owners, Eva Shivdasani, is the creative force behind the hotel's design, and she clearly has that casual upmarket and refined taste! The resort gave us each a bike upon arrival to our villa to make getting around the island easier. Soneva Fushi occupies one of the largest private islands in the Maldives -- meaning that you share this paradise only with a few of your fellow guests. The hotel was almost full during our stay, but thanks to its spread out design you wouldn’t know it. That said, there are plenty of areas where you can socialize if you desire. While you might not come across too many people if you choose not to, there are other residents that you will find harder to avoid – the resident rabbits! These guys found a way onto the island and did what bunnies do: rapidly multiplied! They roam freely, munch on lettuce and carrots and sometimes they’ll even jump into your hands! All the villas have their own little bit of beach and are beautifully designed, but there is a range of different levels of luxury available. We stayed in a beach villa, that had a large living room (I mean large! ), a full bedroom with a closet and a huge outdoor bathroom complete with a stone tub. We also had a loft area outside, and plenty of outdoor furniture on which to relax once we had climbed out of our own personal pool. It was designed like a comfortable, modern version of the traditional beach huts of the region, definitely continuing the barefoot luxury theme! It had a palm thatched roof and wooden furniture, but also all of the latest comforts you expect from a luxury hotel. We could have stayed in our room the entire time if we wanted to, and our Mr. Friday would make sure that we had everything we needed. Our advice however is don't! Get out and explore the island, it’s beautiful and who knows when you will be back in a place as special as this. The resort has seven restaurants and bars, and can also arrange some special meals as well. Whether you're dining in your villa or even on a private island, you can rely on the food being excellent. It all starts with breakfast, where if you are not careful you could end up eating enough for the whole day. There are stations featuring everything imaginable from fresh pancakes and crepes, to omelets and different types of teas and yogurts. It all takes place outside on the beach, under the shade of the swaying trees. 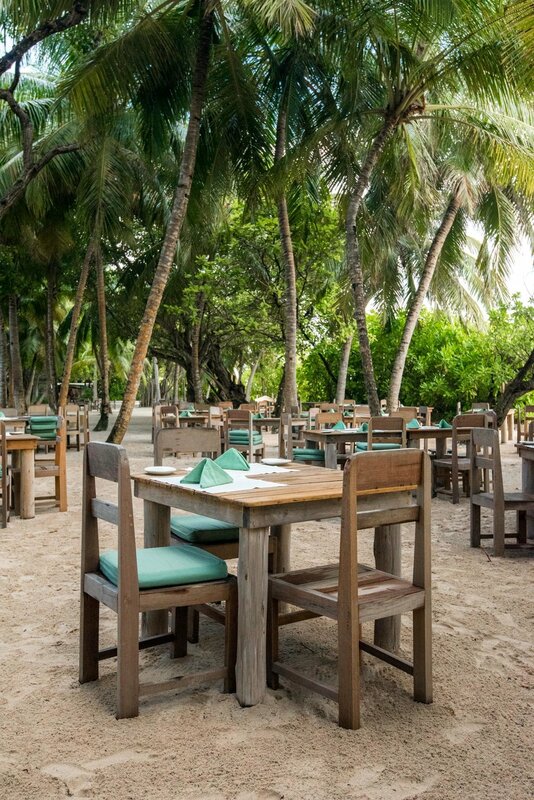 Healthy living is encouraged at Soneva Fushi and there are plenty of fresh juices, smoothies and health-focused dishes, catering to all diets. We had enough time to sample most of the restaurants on the island. “Down to Earth” was one of our favorites, and there we had a delicious Indian meal. We might have preferred “Fresh in the Garden,” which is actually in a treehouse, but unfortunately it was closed while we were there. While we couldn’t experience that, we did have lunch in the garden for which it is named. Here the hotel grows its fruits and vegetables for use in the restaurants, and we enjoyed a feast of Maldivian specialties and curries. 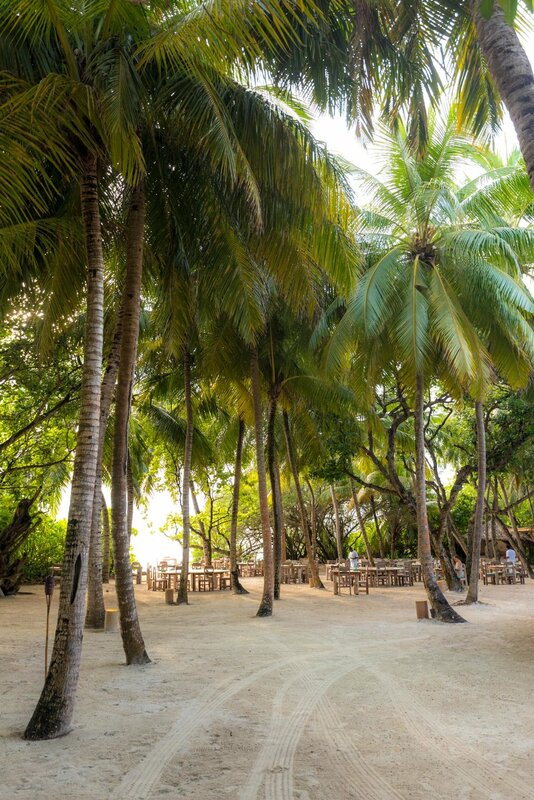 Hanging around the garden while dining on freshly picked veggies and curries was a great way to get a sense of the island and how it is run according to Soneva's slow living ethos. Like the vegetables, much of the island’s needs are produced in house and this helps Soneva meet its sustainability goals. I have a sweet tooth, so perhaps my favorite food option wasn’t actually a restaurant at all. Soneva's round the clock ice cream parlor (serving some of the best gelato and ice cream we’ve ever had...on par with Italy) is a unique and very special feature that every hotel should have! Delicious gelato, ice cream and toppings are available for you to help yourself to at any time! They also have a chocolate room with all kinds of chocolate creations. To keep you entertained between dips in the ocean and scoops of ice cream, the hotel has loads of amenities and excursions to offer. On our first night there, the entire island was invited to go by speedboat to a private island for canapés and cocktails. If you happen to be on property when they do this, it’s definitely worth it. If you’re not, you can always book this on your own, and make it a romantic date. One evening at sunset we went out looking for dolphins, and it really was as wondrous as people say. Dozens of the cute little dolphins were dancing around our boat. It was great to see them in their natural habitat, and although it appeared that they were performing for us, it was the dolphins in charge of the event, and they were there because of their natural curiosity rather than being coerced. It was just another of Soneva’s sustainable experiences, and it was probably the most memorable of the stay. 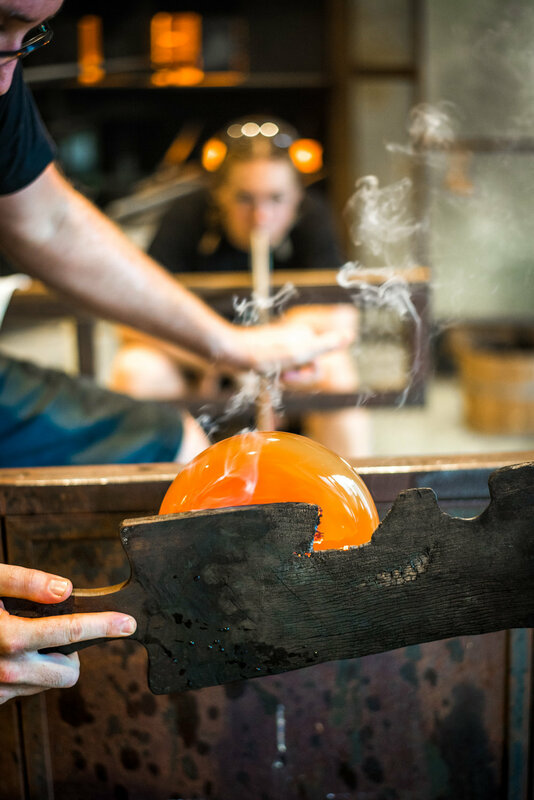 Another interesting feature was the glass blowing studio and shop. 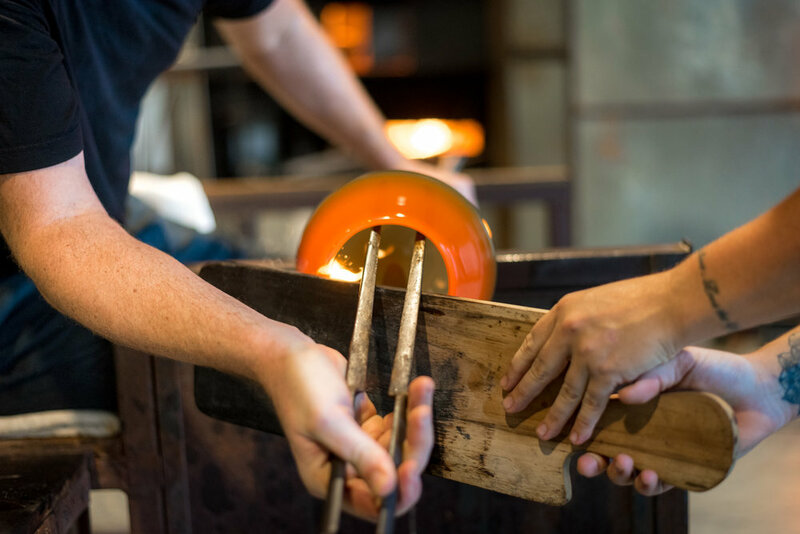 In-house glass blowers and artisans make all of the glass products for Soneva Jani and Fushi on site. It is truly incredible work, and if you have never seen it done before you should take a look! 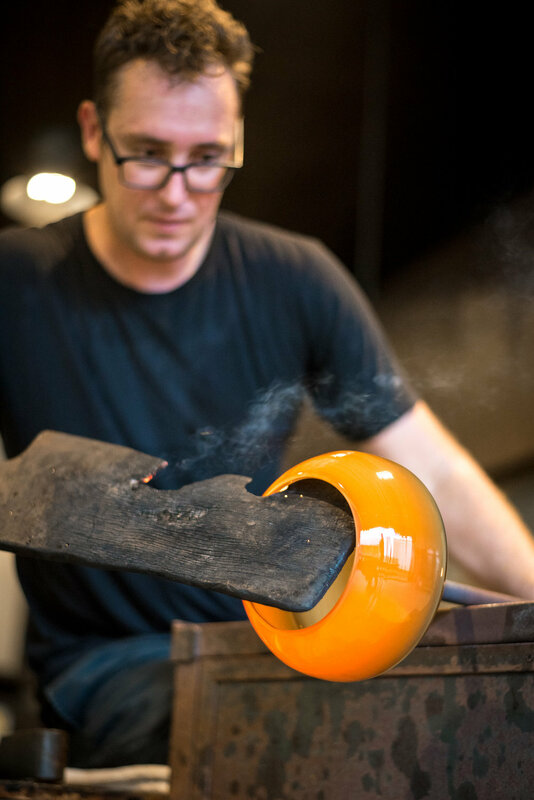 Get a piece commissioned or shop at their boutique – the glass art makes a unique souvenir. The island’s kids club is pretty impressive as well. Although we had no cause to use it, we’ll definitely be back one day as a family. The island is also home to a spa. The Six Sense Spa is in a wooden building towards the center of the island, and it is just as dreamy as the pictures depict. They offer all sorts of treatments and have a gym as well if you want to work off some of the ice cream and chocolate. I went on one of our days there and had a full body massage. It was just what I needed! Soneva Fushi is another one of those bucket list properties. It has the paradise location and the owners have really made the most of it by building a great hotel. Knowing that they do all this in an ethical manner just helps you relax even easier. Make sure you plan your stay so you can visit their sister property, Soneva Jani, which is on a nearby island. Both are united by style, luxury and ethos, but each has its own subtle differences. Soneva Fushi is perfect for families or groups of friends looking to get together and have some privacy.